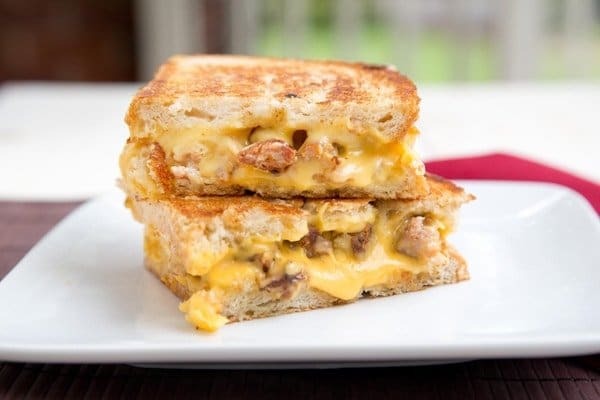 When its time for a meal in a sandwich, try my Grilled Sweet Sausage, Grilled Cheese Sandwich! Hearty and filling full of gooey cheesy goodness! I’ve been on a grilled cheese kick lately, stuffing those ooey gooey sammies with whatever I happen to have on hand. I really think that’s how you need to go about making Grilled Cheese Sandwiches these days, get creative and come up with some delicious combinations. Sweet sausage is one of those items you almost always find in my freezer. I love adding it to dishes and also just grilling it for sandwiches. Add in my favorite American cheese and we’ve got a sandwich happening. I know it doesn’t taste any different than the white variety, and its just the added coloring that makes it that lovely shade of orange-yellow goodness….sigh I know its all psychological, but that melty mass of gooeyness tastes better because of it. After all, We Eat with our Eyes. I know it’s crazy to get so worked up over a simple sandwich, but when you think about these wonderful toasted sandwiches, you have to agree that they are comfort food. Most of us have childhood memories that include grilled cheese sandwiches, and how they made us feel when we ate them. Happy memories make for happy meals and I still enjoy a bowl of creamy tomato soup when I make the standard no-frills grilled cheese. And you know you gotta dunk that sandwich into the soup when you do have those two together. Since I rarely make tomato soup at home and have serious qualms about opening that can of soup that we all grew up on, I’ve decided that making what I like to call my Enhanced Grilled Cheese Sandwiches will more than make up for not having soup. 4 slices of sourdough bread thickly sliced from a wide loaf. Place two of the split links of grilled sweet sausage on one of the slices of the prepared slices of sourdough, then repeat making one more topped slice. Heat your pan on the stove top until it is hot enough to toast the bread. Place the buttered side down on the pan. Turn heat down to medium, and cover the sandwich with a pot lid to keep the heat in and help the cheese to melt. After about 3-4 minutes check the bread on the pan to see how the color is. It should be toasted a dark golden brown. Brush butter on the side that is up, then turn it over to repeat the process of toasting the bread. (Use the pot lid again to help melt the cheese) After 3-4 minutes check that side, to see how the color is. If the cheese is not fully melted, turn the heat down to low and keep the lid covering the sandwich until the cheese has melted. Just be careful not to burn the bread. Thanks Laura, it is truly comfort food! This looks seriously scrumptious to me. I love sausage so this is right up my alley. 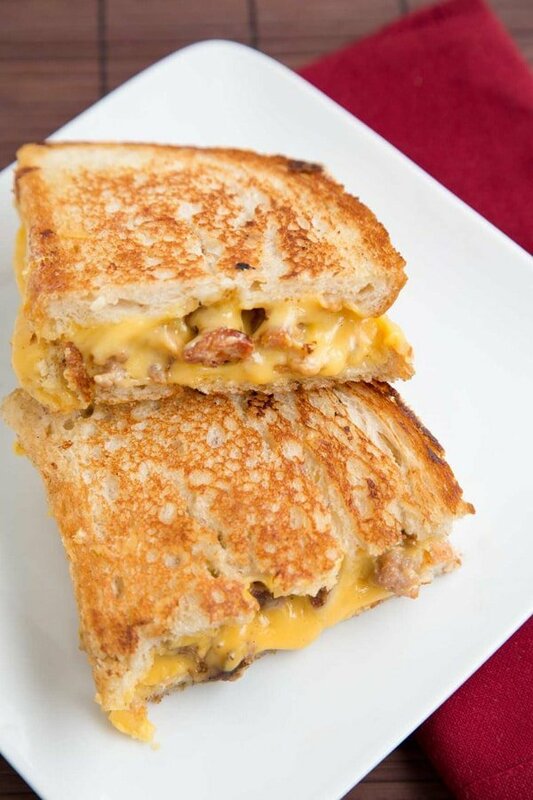 Love this grilled cheese…so yumm! Thanks Minnie! Its my new favorite sandwich! Terrific! 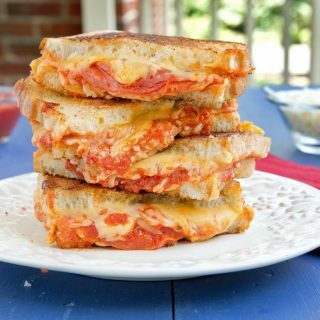 I love grilled cheese and now this is a great new twist for it. Thanks for sharing, Chef Dennis! Thanks Betty Ann, its definitely a keeper! Even in Indiana, we had tomato soup and grilled cheese sandwiches at school. They just go together. I have a pot of my version of tomato bread soup on cooking now. Your grilled cheese with sausage would be the added touch. Thanks Julia Ann, Your Tomato bread soup sounds wonderful! I loved grilled cheese sandwiches and never thought to use sausage in them. I usually just make them with different types of cheeses. Since I love sausage I can see this sandwich happening in my very near future. Up to a few years ago, the most adventurous I ever got with grilled cheese was bacon or tomato, now the skies the limit! That looks so good! I love a good grilled cheese sammie! Thanks Raven! Grilled Cheese is truly comfort food! For me childhood is about spaghetti with tomate sauce with cut up sausages in it. The tomato soup was from a packet and came with little croutons, but the cheese was missing… This is a great meal Dennis, there’s no telling you how much I love sandwiches and sausage! 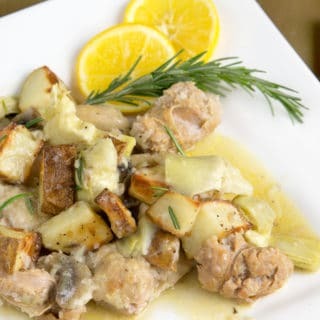 I love connecting food with memories, it makes everything taste better! Wow, your grilled cheese takes the old childhood sandwich up a notch Chef. Thanks Sam, It was one delicious sandwich! Thanks Kristina, I gave up red meat pretty easily but I don’t think I could ever give up cheese. There’s just something magical about it! 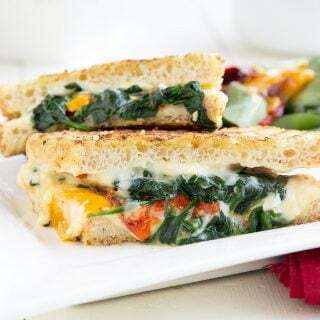 getting creative with grilled cheese certainly yields tasty results, and this looks just perfect! I am so with you on the yellow coloring – somehow it JUST DOES taste better? or is connected to those childhood memories most of us have. you’ve certainly given me a craving. I made a sandwich like this last Sunday. Great minds think a like. Awesome sandwich! 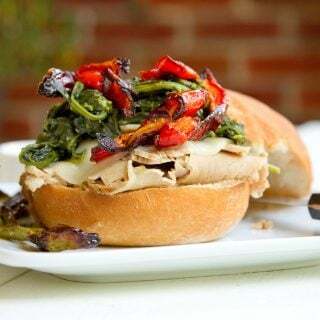 it certainly was an Awesome Sandwich Christine! We always have sausage of some kind in our freezer too. I always toss it into pasta sauces and soups. Never think to put it into a sandwich. Great idea! It looks like we’ll be down in Kissimmee by the end of October if everything works out. Can’t wait to enjoy the blue skies and sunshine! Thank you, I do love my grilled cheese sandwiches! Great job Chef, that looks like a terrific grilled cheese. Thanks for sharing! Your grilled cheese kick is yielding some awesome sandwiches. Thanks Larry, I’ve certainly been enjoying them! Oh those bachelor days…I’ve nearly forgotten what it’s like to eat like one. 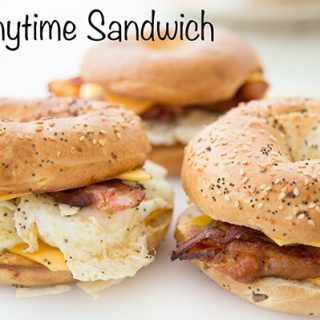 But when whim rules the day, sandwiches like these are dreamed up. American cheese is the quintessential cheese our generation knows well because of the grilled cheese sandwich, and yours looks tasty! 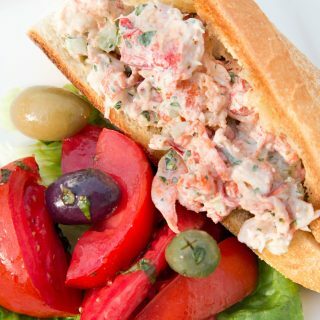 These sandwiches were the hit of the week!